telling the story of Southwestern Dane County from pre-history to modern day. Over 4,000 square feet of space is dedicated to sharing the lives of our rich cultural heritage. from the Society's extensive collection. Come and share the fun and learn about the unique Driftless Area of Wisconsin. Toys through the Decades: A Sentimental Selection is a special exhibition, only showing for a limited time. 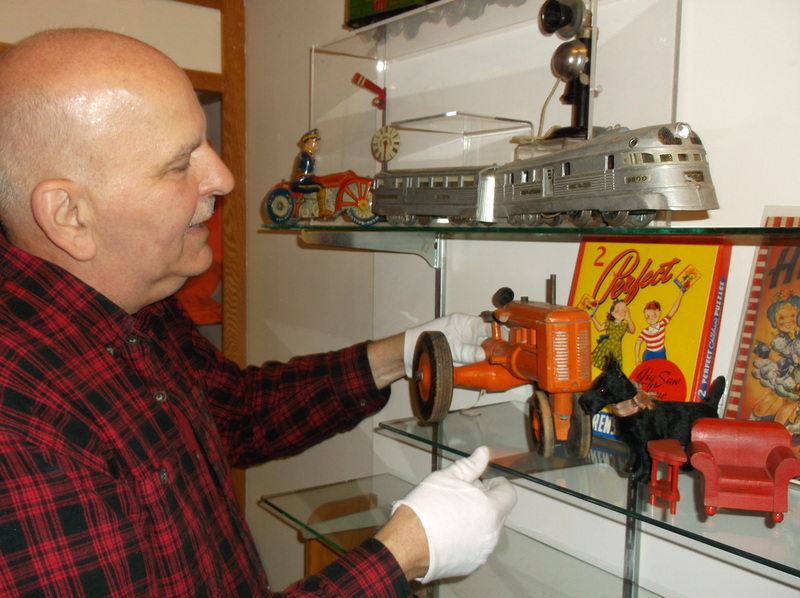 The toys chosen from the collections of the Mount Horeb Area Historical Society included in the exhibit are the objects of play once loved by youngsters from throughout this region of Wisconsin. Most of these sentimental playthings collected by the Society over the last 40 years have never been on exhibit. The toys featured are samples spanning the years 1900 through the 1970s- the decade when the Historical Society was founded. Visitors will take special note of the change in the construction of these everyday playthings; cloth, china, paper and wood of the beginning of the 20th century, heavy steel and tin of the 1930s, wood during the metal shortages of WWII, and plastics of the 1970s. The exhibit is open now through December 20, 2015 during regular Museum hours. 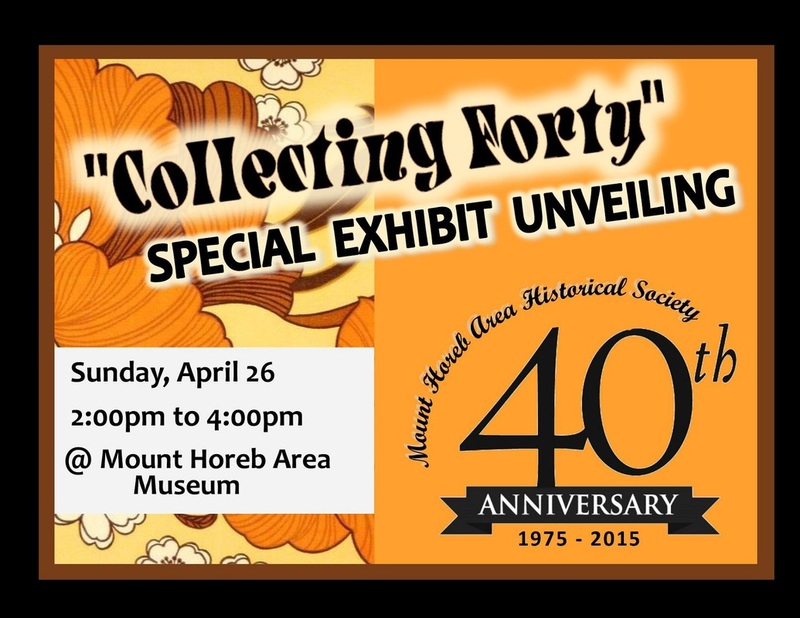 Collecting Forty features dozens of regional artifacts and archival materials celebrating the year long 40th anniversary of the Historical Society, founded in 1975, and shows off the diversity of its collections. Curators of the exhibit chose to represent six separate themes prominent in the Historical Society’s collections, including its vast archive, technological invention, pop culture, the arts, costume and textiles and the organization’s unique practice of collecting current history. The varied themes shed light on why the Society chose the objects for its collections and their impact and meaning to the area’s history. in our main floor gallery, contains fascinating stories as you walk through the lives of Native Americans, Yankee miners and European homesteaders. Our area was home to Hochungra (Ho-Chunk), Scots, New Englanders, German, Irish, Swiss and Norwegians. Each left their mark on the Driftless Area and the places they called home. Natural Wonders and Human Interaction, now showing in the museum's Centennial Gallery, is a b﻿rilliant collection of historic photographs, fine art, and unique artifacts. 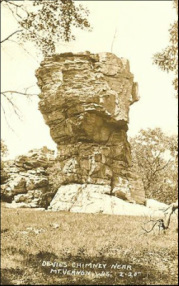 Describing the unique terrain of the surrounding Driftless Area, Natural Wonders shows how the hills and valleys shaped the people who have lived here. From tourist attractions like The Cave of the Mounds to inspiring artists and writers, the area's fragile beauty touches everyone. Mount Horeb Chamber of Commerce Welcome Center. A new exhibit created by the Mount Horeb Area Historical Society is now open at the Mount Horeb Chamber of Commerce Welcome Center. The artifacts and archival materials in the display feature the many ways the Norway Building from the Chicago World’s Fair of 1893 has been used in promotion, publications and art. The pieces are a sampling of items collected by the Historical Society over the past 40 years and include objects recently donated by Scott and Jennifer Winner, Little Norway’s owners. Items on display include an original shingle from the building with a laser art rendering, rosemaled plates, a needle work likeness, 1890s souvenir books, Little Norway promotional pieces, early ticket stubs, and a water color painting. Eleven graduate students from UW-Madison Material Cultural Program Director Professor Ann Smart Martin's AH865 fall semester class, as a required assignment, selected a specific artifact from the MHAHS collection and conducted research as to that particular item's many unique historical, cultural and social contexts. They were assisted in their work by Society Curator Johnna Buysse and Volunteer Brian Bigler. Three of these students were so impacted by this project that they, upon their own initiative, created a temporary art installation inspired by their relationships with their selected historic artifacts. We, at the Society, were humbled and honored by this gesture- while simultaneously agreeing that artifacts are a powerful repository of meaning, emotions and past activity.